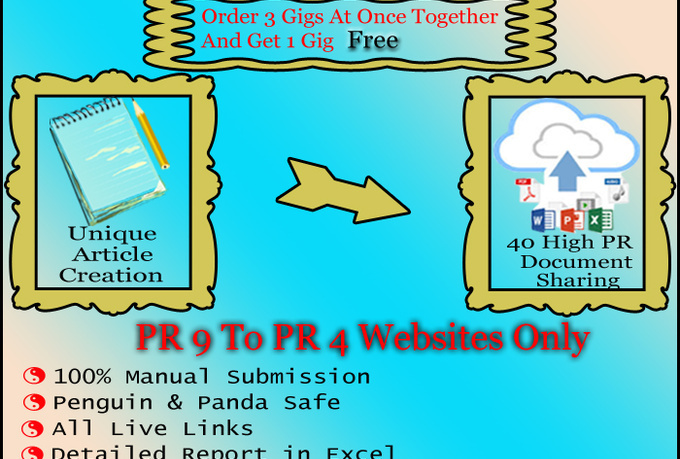 All will be live links and this will give you do-follow backlinks. All the submission will be between PR9 to PR2. All the submission will be done 100% Manually. A Full detailed Excel Report will be given. You will not get login details of any sites as all will be live links. If you need login details and want me to create unique accounts for you then order an extra gig for that. create 3 unique articles and upload to 120 high pr document sharing sites is ranked 5 out of 5. Based on 7 user reviews.